Mastery of light and shade - rendered with accuracy and expressive power - is the key to three-dimensional form in drawing and painting. Here is the first book on this essential subject, the product of years of study by one of the world's great teachers of drawing and an artist of international renown, Burne Hogarth. Hogarth begins with the simplist kind of light and shade, showing how a dark silhouette on white paper can communicate form and space. He then shows how the silhouette is transformed into three dimensions with the addition of minimal light - the highlight. Following these instructory chapters, Hogarth devotes a separate chapter to each of the given basic categories of light and shade: single-source light; double-source light; flat, diffused light; moonlight; and sculptural light. In these chapters Hogarth illustrates the effects of these different kinds of light on a variety of subjects and examines both natural and artificial light sources. Moving on to more complex lighting effects, Hogarth explains spatial light - how light and shade can create a sense of "near and far"; environmental light - the effects of weather, time of day, and the changing of seasons; textural light - how light reveals the surface qualities of forms that range from rough stone to silk and satin draperies; transparent light - the effects passing through transparent materials like glass and water, and translucent substances like moving water or sailcloth; fragmentation light - the disrupted light we see in such subjects as fire, rain, and flying snow; radiant light - the intense light we see when we look into the light source itself, which may range from the sun to a candle flame; and finally the various kinds of expressive light invented by the artist - such as the symbolic and mystic light of religious art, or the paterns of light and shade that convey a mood or a psychological state. Burne Hogarth illustrates every effect of light and shade with brilliant drawings in pencil, charcoal, carbon, pen and ink, and brush and ink, encouraging the reader to experiment with diverse drawing media. 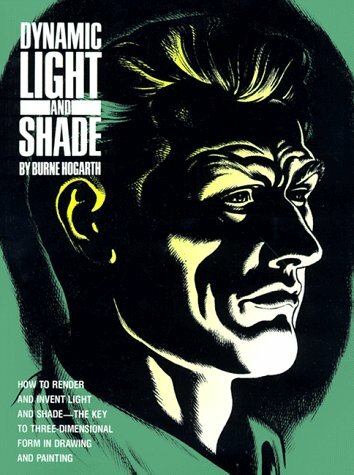 Dynamic Light and Shade is an essential volume for everyone who draws and paints. Burne Hogarth’s (1911–1996) remarkable career spanned over 60 years. He wore many hats in the worlds of fine art, art education, and art publishing. He is most famous for his internationally syndicated Sunday newspaper color page feature “Tarzan” (1937–1950) and for his illustrated adaptations of the Edgar Rice Burroughs novels Tarzan of the Apes and Jungle Tales of Tarzan. A co-founder of the School of Visual Arts in New York City, Hogarth remains one of the most influential figures in art education today.